Old map by QUAD -Typus Orbis Terrarum, ad imitationem universalis Gerhardi Mercatoris. Title: Typus Orbis Terrarum, ad imitationem universalis Gerhardi Mercatoris. Size: 8.6 x 12.4 inches. Condition: Upper, lower and left margin extended. Small part of left corner redrawn (2mm). 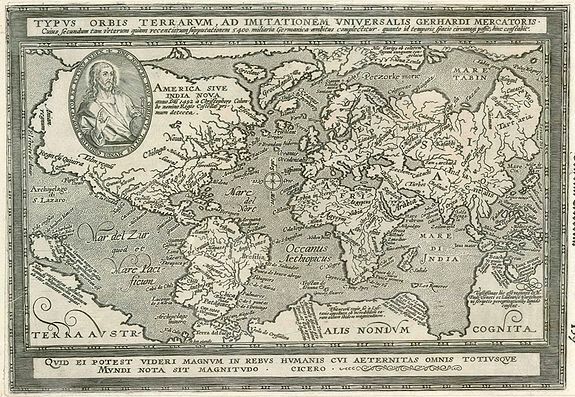 Rare world map by Matthias Quad, reduced from Mercator's planispherical map of 1596, with the addition of the figure of Christ in an oval frame in top left-hand part and a quotation from Cicero at the bottom. Verso blank. The map features a large "Terra Australis Nondum Cognitae", which occupies much of the southern hemisphere. Including the mythical islands of Groclant, Thule, Frischlant and S.Brandam around Greenland. German text on verso.